The following is an excellent Task B GAMSAT essay sent in by a student preparing to sit the test next month. The student directly responds to the given quote; clearly and concisely demonstrating a perspective by which it might be understood to be true. As you can see the argument is simple and the sentences are brief. The overall effect is an essay that is easy to read and easy to understand. Exactly what an examiner wants to see! “The Internet is so big, so powerful and pointless that for some people it is a complete substitute for life.” – Andrew Brown. This quote summarises the opposing qualities of the Internet. The Internet is vast, and in this day and age it allows you to do practically anything that you can do in real life. It is so powerful that it can connect people on opposite poles. However, what is its purpose if all of these activities can be undertaken in real life? The Internet has grown enormously in the last decade. More websites appear everyday. The list of activities that one can partake in is endless. A couple of the major sectors are entertainment and socialisation. In the real world, one can read a newspaper in order to enhance their knowledge of what is going on around them. Nowadays, this can be done on the Internet. In the real world people play games with their friends, but now this too can be done online. Some people like to go into betting shops and place bets on sporting events, the Internet now allows people to do this from their own home. Socialisation is something all humans crave. One used to have to venture outside their house to socialise, but now the internet has made it possible to socialise without leaving one’s home. What you say is not necessarily what is heard. The idea starts in your mind, gets translated into words on the page, and is then interpreted by the reader. By the time the idea gets into the reader’s head it can be very different to what it was when it started out in your mind. ‘Clarity of communication’ refers to the apparent degree of distortion of your ideas as they are translated and communicated from one mind to another. 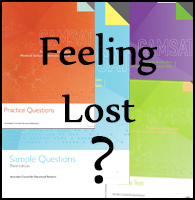 And it is a critical part of the GAMSAT Section 2 marking scheme.